Sign up now for massive discounts on your first booking! You can check its usage terms and conditions on Spring Sale page. We value our customer experience on our website and app, if you have any suggestion regarding our website please send us your feedback below. Find a lower price, we'll refund you 200% of the difference. The Happyeasygo.com Best Price Guarantee applies to every Airline Ticket Reservation sold on Happyeasygo.com! The lower price, including taxes and fees, must be available to the general public for booking on a website in the same currency in India, using the same form of payment and from the same point of sale as your original reservation at the same time (valid for 5 minutes) when you contact us. The lower price must be an exact match to the itinerary booked on Happyeasygo.com, including offering a same cancellation policy and fare rule. For reservations that are not pre-paid, we will either help you cancel your reservation so you can rebook at the lower price, or we will refund 200% of the difference after travel is completed. Our Best Price Guarantee does not apply to fares that aren't available to the general public, such as those for corporate customers, military personnel, students, children, senior citizens, groups, and members, as well as wholesaler and consolidator fares, convention rates, and fares purchased through coupon promotions, loyalty and other "reward" programs. Fares that have been partially refunded or canceled by Happyeasygo.com or others, and fares that are part of promotional packages or that include additional amenities, such as parking, meals or other services are excluded from the Best Price Guarantee. Contact us within 24 hours of booking to initiate your claim. 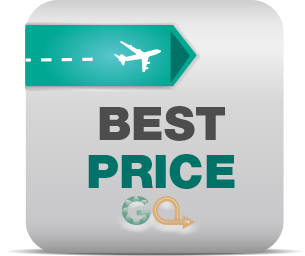 Tell us where you saw the lower price and send us the price details proof materials by Email within screenshot, including the Itinerary, Airline, Flight Numbers, Travel Dates, Departure & Destination Airports, Cabin and Class of Service etc. We will verify the price and availability right then in 24hrs, and we will refund your 200% difference charge in 5 workdays if your claim is valid. All brands, logos are trademarks or registered trademarks of their respective owners.